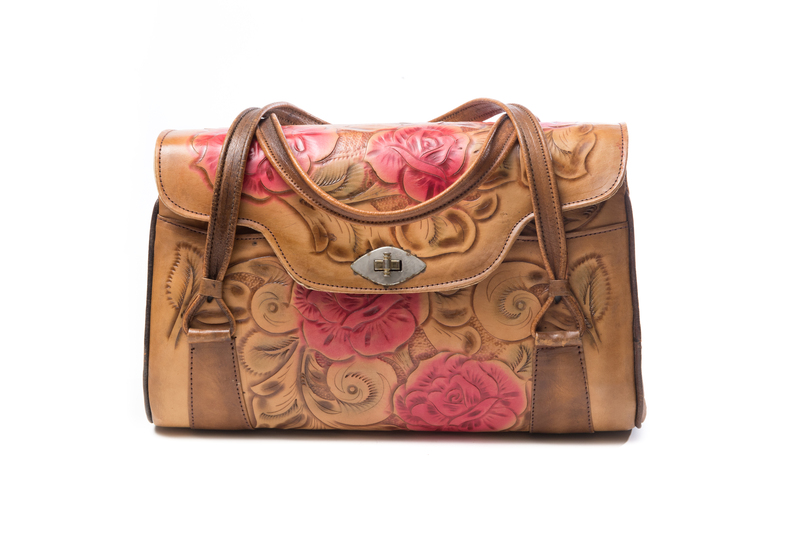 Purse; Large, tan leather purse is tooled with a design of roses and leaves softly tinted red and green. It has a saddle bag flap held shut with a shaped silver thumb clasp. Two leather straps are attached to the front and back of the purse as handles. The large interior compartment is completely lined with a heavy, sueded tan canvas. A zippered central pocket, made of the canvas, divides the compartment. A rectangular patch pocket is applied to the lining at the back of the purse. Two outer pockets at front and back are lined with a pale green taffeta. Silvertone metal "feet" are fixed at each corner of the rectangular bottom of the purse. Made in Mexico.